Easy data entry and recall (not in DOS format). Records ALL animal events - providing action list for all up and coming events. Herd or individual animal perfomance reports for all aspects of herd management. Optimize your herd decision making power. Updated continually to provide new program features. Milk and meat withdrawal times provided per animal per treatment & vaccination event. Full Drug Compendium for all products in the Treatment Cabinet. Standard Operating Procedures (SOP's) - create and access your personalized SOP's for your farm. On-line registration to Holstein Canada or print a hardcopy paper registration. Fully compatible with DHI and CanWest DHI with direct data transfer to and from the milk recording agencies. Links with milking parlour systems to send and receive daily herd and production data. Certified Canadian Quality Milk (CQM) compliant. In VAMPP record and retrieve all information to make your herd record keeping CQM qualified. Designed, updated and supported by people involved in the dairy industry - with the goal of serving first and foremost the dairy producer. Windows based software for Windows 95, 98, 2000, XP and Windows Vista. 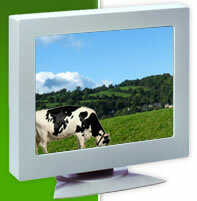 Vampp Dairy Management Software is leading the way with on farm, innovative, dairy management software.